Broad Windsor Fava Bean Garden Seeds. Vicia faba. 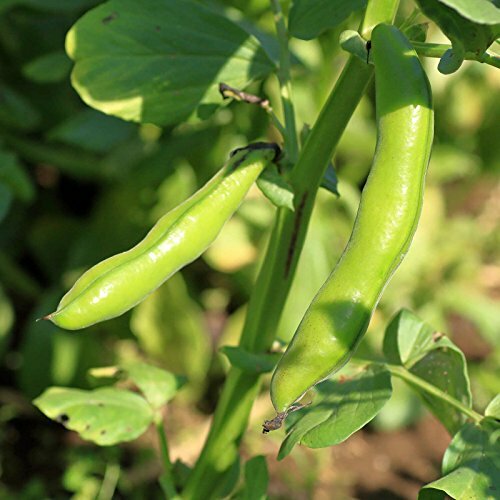 Broad Windsor Fava Beans will grow in temperatures as low as 40 degrees or as high as 70 degrees. When you plant fava beans, plant them in full sun in a loose well drained soil. Fava beans need a rich soil to grow in so add some organic matter to your fava bean soil. Manure or compost works well for an organic material. Once the fava beans are planted keep the soil moist until the beans sprout. Then only water them when the soil dries out. When the fava beans are flowering you should keep the soil moist again so they can produce pods. Height - up to 4 inches. Spacing - 6 to 8 inches. Depth - 1 1/2 inches. Sun - full to partial. The plants are most often harvested in the green shell stage when they first reach full size, but before the skins start to toughen. At this time, the pod will still be quite soft and the seed will not be much bigger than a penny. Gathered at this time, the seeds are tender and delicious.